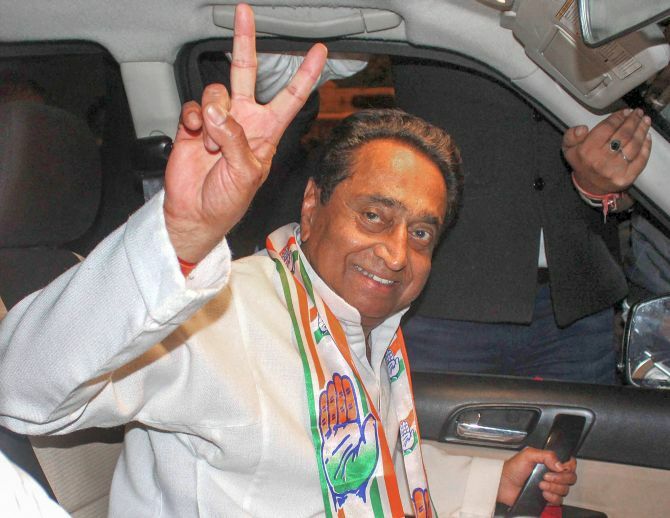 Senior Congress leader Kamal Nath will be sworn in as the 18th chief minister of Madhya Pradesh on December 17. Governor Anandiben Patel invited Nath, 72, to form the new government in the state, after he met her at the Raj Bhavan on Friday to stake claim to form the government. “As the leader of the single largest party, I appoint you as the chief minister of under Article 164 of the Constitution and invite you to form cabinet,” she said in a letter to Nath after their meeting which lasted around 50 minutes. Talking to reporters outside the Raj Bhavan later, Nath said the swearing-in ceremony will take place at the Lal Parade Ground in Bhopal around 1.30 pm on December 17. Nath, who has held several portfolios in the Union cabinet, will be the 18th chief minister of Madhya Pradesh after the state was formed on November 1, 1956. The nine-time Lok Sabha member from Chhindwara was on Thursday night elected as the leader of Congress Legislature Party. Nath met the governor along with senior party leaders, including Digvijay Singh, Vivek Tankha, Ajay Singh, Arun Yadav and Suresh Pachouri. They apprised her about his election as the CLP leader. Appointed as the Madhya Pradesh Congress Committee president on April 26, Nath was at the forefront in steering the party to a win in the November 28 assembly polls. The results were declared on December 11. The Congress, which won 114 seats, has secured support of 121 MLAs, including Samajwadi Party (1) and Bahujan Samaj Party (2) legislators and four independents, to cross the majority mark of 116 seats in the 230-member assembly. The Bharatiya Janata party, which ruled the state for 15 years, got 109 seats in the elections. The saffron party’s Shivraj Singh Chouhan was the state’s longest serving chief minister since taking charge in 2005. The Congress named Nath to head the CLP on Thursday night after hours of hectic parleys held by party chief Rahul Gandhi with senior party leaders.